I’ve had the most fun with a wide variety of quilt stitches in abstract curves art quilts. I like to make these art quilts by starting first with an interesting, often modern print, and then building the other fabrics and colors around that print. Sometimes I put on a significant border into which you can extend your free motion stitching. While the fabrics, colors, and unusual designs and piecing are focal points for these quilts, the selection of free motion stitch designs add quality and depth to each quilt. My first example is a colorful curves quilt in which the different free motion stitches for differen t fabric sections (some sections are quilted together) bleeds into the border. I’ve used a variety of thread colors, usually related to the fabric color being stitched, and a wide variety of stitches, sometimes taking my cue for a stitch design from the fabric itself. 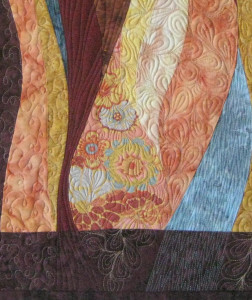 A picture of the full quilt is included and a close up shows some of the different stitches and how they bleed into the dark, solid border. In a smaller curves quilt, Old English Garden, again I used a variety of free motion stitch designs but without a larger border. 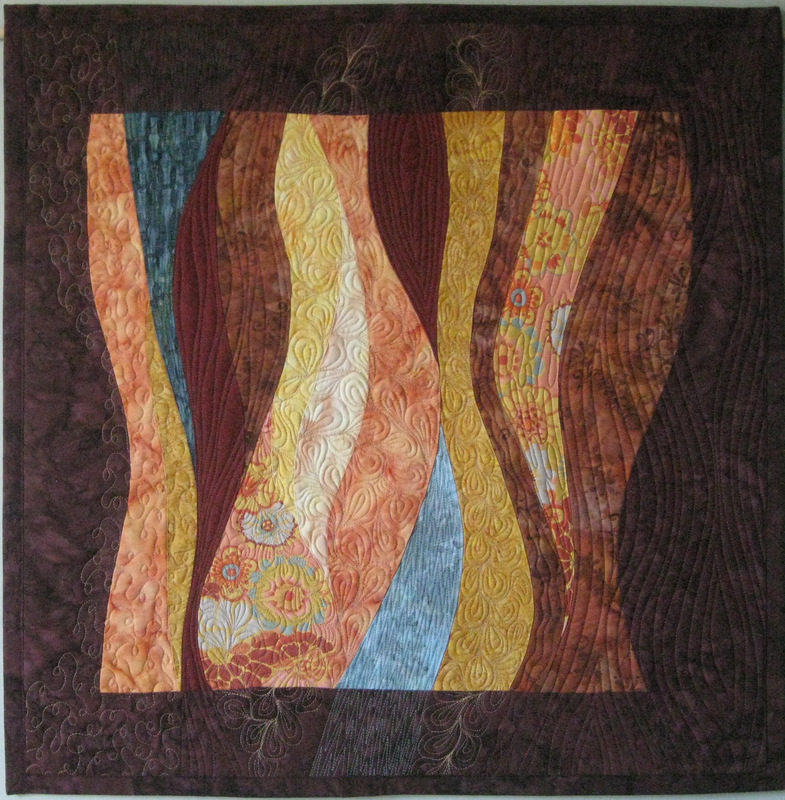 In the this quilt I used a vertical curved stitching design with which to create open spaces, similar to the echo stitching discussed in a previous blog. In these open spaces I used a tightly sewn stippling in some parts and a pebbles design in others. In the primary black print of the quilt, I actually created my own kind of flame like stitch design that mimicked a pattern in the fabric background. My goal is always to enhance a quilt, highlight beautiful fabrics and provide additional unique interest and texture to the art quilt. 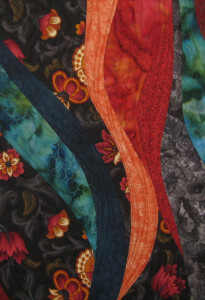 I need to make a quilt with curves or circles in black, white, grey and color of my choice which is teal. Thought this pattern would work well. Can I buy pattern? I’m sorry but I don’t use patterns.